Getting some buds with seeds and stems in it can be a nuisance but it does happen occasionally. Sometimes it can be frustrating; big stems add weight and so do seeds and you might think you can’t do anything with stems… Right? Okay while seeds and stems definitely aren’t as good as actual buds, they aren’t completely useless. Many people I’ve known over the years collect their seeds and stems, hiding them away for who knows what. Most people used to think you could only brew tea but now that we have a better understanding for our beautiful Mary Jane, seeds and stems can be used for all kinds of different amazing things. Here are five that we have put together for you. Enjoy! Cannabis topical products are very popular right now, as they have an amazing ability to provide relief for a multitude of ailments. If you’ve been saving your stems, making a cannabis topical might be the way to go. Find a 420 friendly topical recipe (there’s one in the Stonerdays Cookbook section!) and go to town. If you’re not familiar with bubble hash, it is a solventless hash that’s made by washing resin off of cannabis plants. Stems don’t have a lot of resin on them but when there are enough of them, they can produce bubble hash. Have a huge stockpile of stems? This may be the choice for you. It may sound silly but yes, you can make a pen using cannabis stems. You will need to use stalks from leftover harvests because the pens need to be pen-sized, a drill press, sand paper, and a basic pen kit which you can either buy online or at a craft store. Love smoking but hate butane fumes? Feeling motivated and want to make your own hemp wick? Well you can use your stems for that. Using longer stems or stalks, strip them until you have a good amount of long, stringy fibers. Twist the fibers together tightly to form a thin rope. Fold the rope in half and twist it together again. Dip the whole thing in beeswax and wipe off the excess. Yes you can actually make your own hemp paper with stems that you’ve saved. To make this, you just need to soak ground cannabis stems and paper scraps in water overnight. After you soak it, add the paper/stem solution to a blender and blend thoroughly. Add water as needed. Pour the pulp evenly on to a screen (or “deckle”). You can make your own at home by stretching nylon stockings over a wooden frame. The drying process usually takes around 24 hours but keep an eye on your paper and remove it from the deckle before it is completely dry. 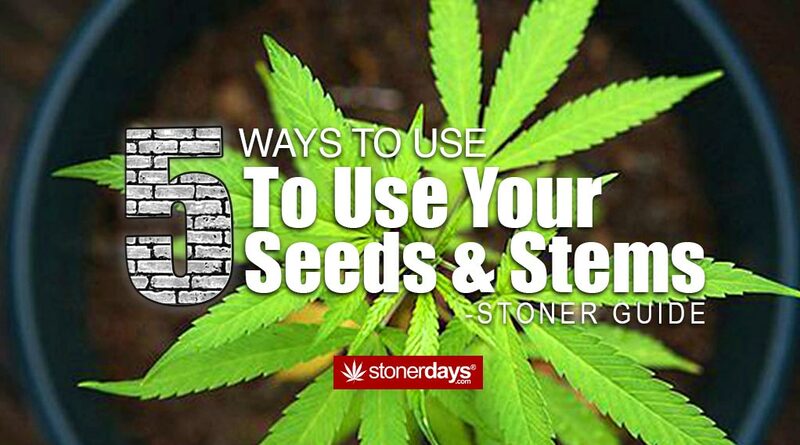 If you have other ideas or know of other uses for seeds and stems please let us know in the comments below. Thanks.